Years ago, Florida-based retailer Smoke Inn launched the Microblend Series, a program that commissions custom, limited edition blends from top manufacturers. “The Microblend Series not only represents my love and passion for fine cigars but the appreciation and fellowship for the cigar manufacturers that were so amazing to work with on each release,” said Abe Dababneh, owner of Smoke Inn. Today, the series includes Tatuaje’s Anarchy and Apocalypse, My Father’s El Hijo, Padrón’s 1964 Anniversary SI-15, Quesada’s Oktoberfest Dunkel, Room 101’s Big Delicious, Drew Estate’s Pope of Greenwich Village, and 601’s La Bomba Bunker Buster. One of the earlier additions—and one of the few from the collection I hadn’t smoked, until recently—was Solaris from Arturo Fuente. Solaris has a light brown, slightly reddish, clean wrapper beneath a classic Fuente band of red, gold, and green and a secondary band denoting the Solaris name. It clocks in at 6 inches long with a ring gauge of 49. The well-constructed belicoso cap clips easily to reveal an ultra-clear cold draw. The pre-light notes are incredibly faint, even at the foot; only the slightest hints of sweet hay are evident. Smoke Inn describes the Solaris experience as follows: “When smoked, we found the flavor mellow yet complex. One could definitely taste the quintessential Fuente flavor profile behind the elegantly aged smoke.” My experience was not dissimilar. I would describe the profile as balanced, bready, medium-bodied, classic, and Cubanesque. Flavors range from sweet cream, roasted nuts, hay, toast, and warm tobacco. There is minimal spice. A pesky sourness can creep in randomly, but this taste can be limited by taking your time between puffs. As Solaris progresses to the midway point and beyond, the texture takes on a more syrupy character and the intensity ramps up a bit—though, in my opinion, never moves out of the medium-bodied range. The sweetness and nuttiness are awesome at times, difficult to detect at others. All the while the construction is impeccable. The smoke production is high, the ash holds firm, the draw is clear, and the burn is straight. Solaris sells for $44.75 for a 5-pack or, while not currently available, $89.50 per 10-pack. That means the per-cigar price is $8.95 apiece. 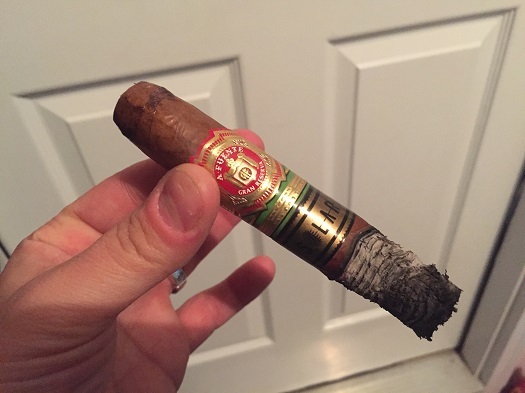 That’s a great value, especially if you’d appreciate a classic-tasting, well-constructed, finely balanced, medium-bodied cigar with a profile that will remind you of other fine Fuente smokes. That’s why I’m awarding the Arturo Fuente Solaris an admirable rating of four stogies out of five.